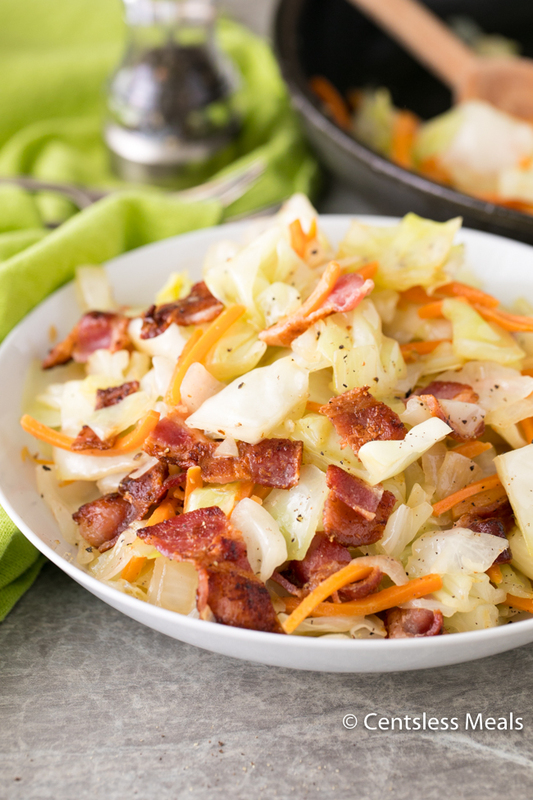 Fried Cabbage is a delightful vegetable dish that is warm, filling, and a nice change from green beans! It is cooked in very little oil, it’s really easy to make, and it cooks quickly with very little of your attention — just a few stirs! Pin it to your SIDE DISH BOARD to SAVE it! Here’s a delightful vegetable dish that is warm, filling, and a nice change from green beans! Fried cabbage is actually cooked in very little oil, it’s really easy to make, and it cooks quickly with very little of your attention — just a few stirs! 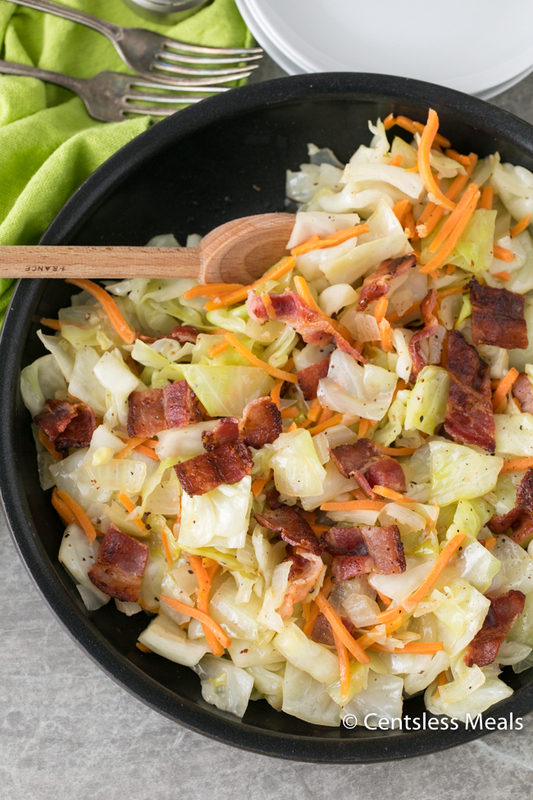 You can make this fried cabbage with sausage or bacon – either choice will give you a delicious meaty flavor and will add some protein to the dish. If you choose sausage, consider using one like kielbasa or smoked turkey sausage, and then cutting it into ¼ inch cubes before cooking it lightly. You can use, hot, medium, or mild sausage depending on your own taste. Keep in mind that if you use pre-cooked sausage, lightly cook the meat in 1-2 tablespoons of cooking oil so that you will have enough drippings to cook the cabbage and vegetables. 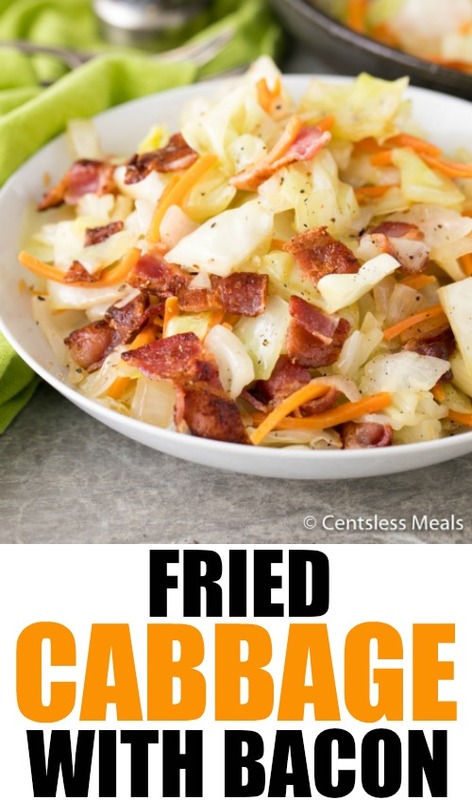 This recipe is actually very close to stir fried cabbage because of the fairly low oil needed, and because you should stir the dish at least a few times throughout the cooking time. I really like to make this fried cabbage in a large cast iron skillet (as opposed to a stainless steel or non-stick skillet) because I think that cast iron adds a bit more hearty flavor to the dish. You can of course choose any good-sized skillet. 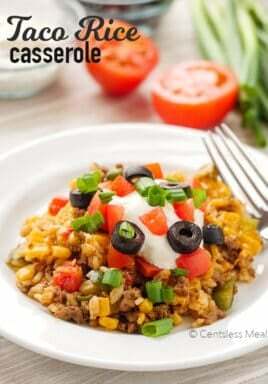 You can easily keep this dish vegetarian by eliminating the meat and using 2 tablespoons of vegetable oil (canola or safflower are great!) in place of the meat drippings. 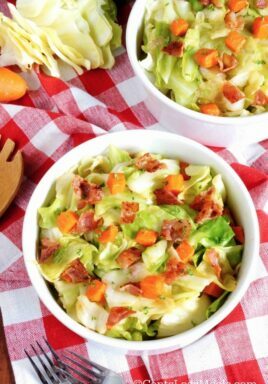 You can cook the cabbage to your desired level of doneness, as some people like cabbage extremely well-cooked, while others prefer a little firmer texture to this vegetable. When preparing with sausage or bacon, you can sprinkle the meat on top, or even stir it right in, just before serving! Change up your vegetable routine with this great tasting fried cabbage! 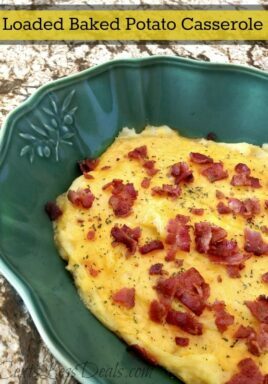 You can make this dish quickly and easily, and it will most likely become a regular feature in your household! Cook bacon over medium-high heat until crisp. 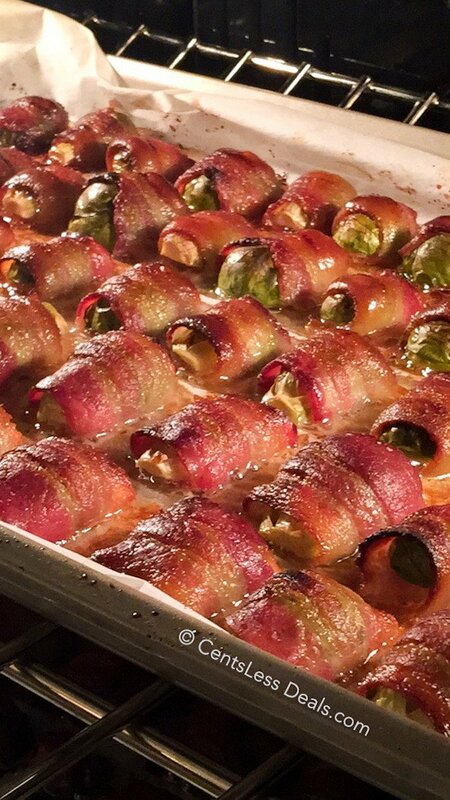 Remove bacon, reserve drippings, and set aside. Add butter to the drippings and cook onion until tender, about 5 minutes. Add garlic, cabbage, carrot, salt, and pepper. Cook about 5 minutes. Add sugar and water. Let cook until cabbage is softened, about 15 minutes. Sprinkle with bacon before serving. I don’t read in direction when to add garlic. You add it in with the cabbage. Fixed, thank you Nancy! Try adding a bit of lemon juice just before serving. 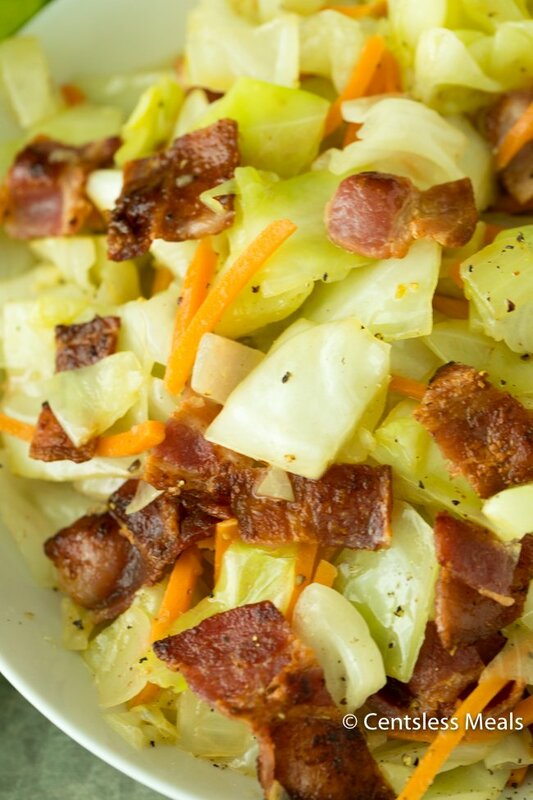 Brightens the flavor and cuts the greasiness of the bacon. Just a teaspoon or so. My Polish granny taught me that trick. Do you have to add sugar to it? The sugar is a very small amount. 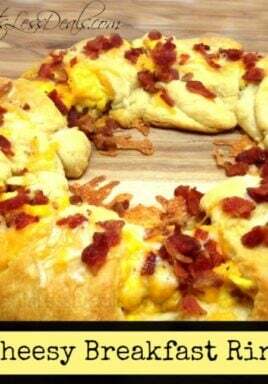 I’ve only tried the recipe as written, but think that you can leave it out if you prefer. Enjoy Terri!